With large, softly ruffled flowers splashed with rosy pink and creamy white, this gorgeous petunia lends a cool, alluring presence to pots, planters and baskets. Blooming luxuriantly from spring until frost, the bicolor beauties are magical in a border amid purple foliage and grasses, deep blues and chartreuse flowers. With a mounded growth habit, they exude old-world elegance. 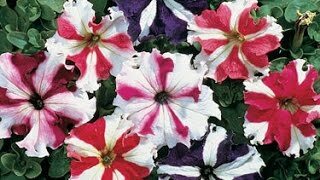 Petunia, Fancy Dress Hybrid is rated 3.2 out of 5 by 5. Rated 1 out of 5 by biddels from Not what was expected Germinated very well, 90%. The first 2 or 3 blooms on each plant were fantastic.. lots of purple mixed in with the lime green. After that... blooms have been just pale yellow. Hoping they get more purple as the summer goes on. Rated 5 out of 5 by twiggy8085 from Adorable! I purchased this petunia last year and it did terrific in my garden. It's always a surprise when they pop open. They are all different. Love them. Rated 5 out of 5 by PetuniaLover from Fancy Dress Petunia This flower caught my eye in the catalog and I just had to have it! Like the others stated, they were super easy to grow from seed. The first blossoms displayed more of the purple-pink color, but they are still beautiful! And they still display the purple-pink color. Each blossom is unique, that's what makes them special! The blooms are so big, I just smile every time I see them. I hope to purchase these seeds again next year. Rated 1 out of 5 by Seedling from I had no problem growing these from seed. They were quite simple and took off wonderfully after I transplanted them into pots outdoors. They are quite peculiar as their color has changed 3 times. They started off a solid purple-pink color and then moved into what the picture on the website showed and now they are a solid cream. Hmmm, not sure if the show on these petunias is what I was expecting. When they bloom as described, they are pretty however they only seemed to bloom as described in one cycle. After the flower blooms and is discarded the next bloom/flower is a solid color. Solid cream colored petunias is not what the description stated. Rated 4 out of 5 by SunnyMNGal from Unique, Happy Flowers Unusual color patterns. From my 1 packet of seeds I wound up with 9 sturdy plants. 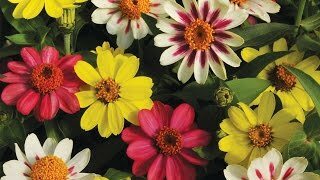 Each has it's own color pattern, making an interesting assortment in the pot. Soe are nearly one color, with light streaks, others are vividly marked. The only down side is that the bright intensity of the color fades pretty fast, within a couple of days after opening. But many new blooms come quickly as well.